Who doesn't love an ANZAC biscuit? Oaty, sweet and crunchy. They are easy to make and from basic ingredients most cooks have in their pantries. Contrary to popular belief ANZAC biscuits weren't sent to troops to Gallipoli, but an oaty biscuit or 'soldiers biscuits' were made and sold at fundraisers, fetes, and parades to raise money for the war effort. The first mention of ANZAC biscuits in a cookbook was in 1921. 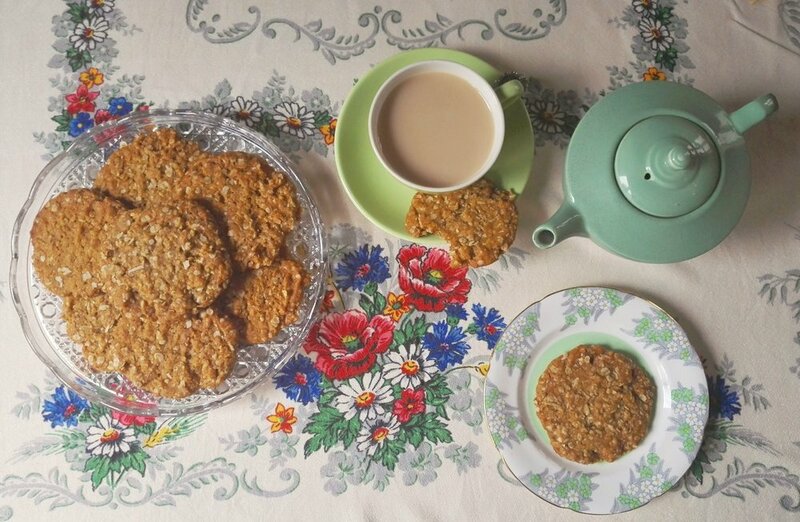 ANZAC biscuits have become a real kiwi favourite and enjoyed with a cuppa any time of the year, but even more so as we remember those who fought and sacrificed their lives at Gallipoli. 1. In a large mixing bowl combine rolled oats, sugar and coconut. 2. Sift flour and ground ginger and mix together. 3. Melt butter and golden syrup together and add to dry mixture. 4. Lastly, add dissolved baking soda and mix ingredients until well combined. 5. Roll mixture into 24 even sized balls and place on two baking trays lined with baking paper. 6. Flatten balls slightly with the back of a fork. 7. Bake at 160c for 15 mintutes or until golden.